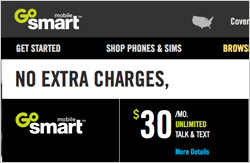 For those who are tired of hidden restrictions and charges of wireless contracts, T-Mobile has a new pre-paid wireless brand: GoSmart. The GoSmart will be targeted toward younger, less affluent and/or multicultural consumers who don’t need or want to be in a contract plan or higher-fee prepaid plan, he says. The brand will be built on three pillars: price, simplicity and network quality. To differentiate itself from the parent brand, GoSmart will shy away from using its T-Mobile’s imagery (including its Carly spokescharacter) and signature magenta coloring. With a smaller marketing budget, much of GoSmart’s marketing communications will be through retail and social media channels, Gujarati says. Though launching a brand that is owned by, though separate from, another larger company is challenging, it’s not entirely unheard of in the telecommunications (or other industries). Sprint, for instance, has its flagship Sprint brand, as well as prepaid brand Boost, Virgin Mobile and Paylo brands. The GoSmart brand isn’t intended to replace T-Mobile’s contract or pre-paid plans, but instead is to go after an entirely different segment, Gujarati says. He also expects the brand to continue should T-Mobile’s proposed merger with MetroPCS go through. “We truly believe the brands T-Mobile has today and may be having in the future will be complementary,” Gujarati says.